Ashely Didn’t Just Circle ‘No’ On This Note…She Wrote A Scalding Explanation Too! You probably remember people telling you that “if you don’t have anything nice to say, you shouldn’t say anything at all,” but obviously no one bothered to tell that to Ashely. She didn’t know what to expect when this folded piece of note paper slid across her desk during class, but after she realized what it was…she just couldn’t help herself. A boy in her class slipped her a note asking if she would be is girlfriend because he liked her a lot. All she needed to do was circle her answer: yes, no, or maybe. Ashely circled ‘no’ but decided to explain herself. 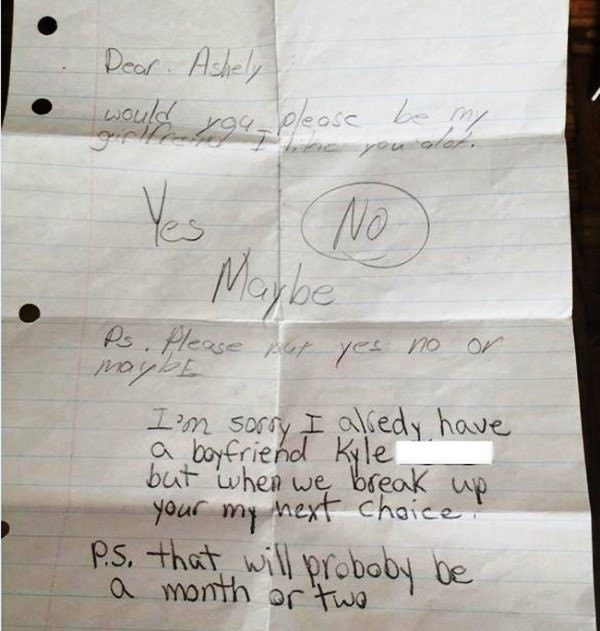 Spelling errors and all, she told him that she was already dating Kyle…but that he could totally be next because she would probably be breaking up with Kyle “in a month or two”. Some of the people who saw the note suggested that he show her response to Kyle so that “a month or two” could actually be that day instead! In the end, she probably would have been better off simply telling him ‘no’ but thanks to her explanation, the adorable love note has now gone viral. Middle school romances might not ever end well, but at least they have now entertained thousands of people on the internet.